It’s fair to say that I’ve been pretty excited to see “Dredd” since I first read about it star earlier this year. I’ve been a fan of the character since he was shoving his judge boot into lawbreaker faces back in the 80s, and I’ve always figured the franchise could withstand a little updating, especially if someone could manageto improve the subtle play between action and satire that sat at the heart of the hyper-violence and broad humor of a one-dimensional character who can act as judge, jury and executioner. Obviously the Stallone film from the 90s didn’t get that. That filem weighed down by too much star power, too light a script, and terrible editing. The 90s were a tough time for genre, and while some films (like Demolition Man) were improved by the wacky sheen that the Fruitopa decade movies seemed intent on putting on everything many other films were sunk by it. 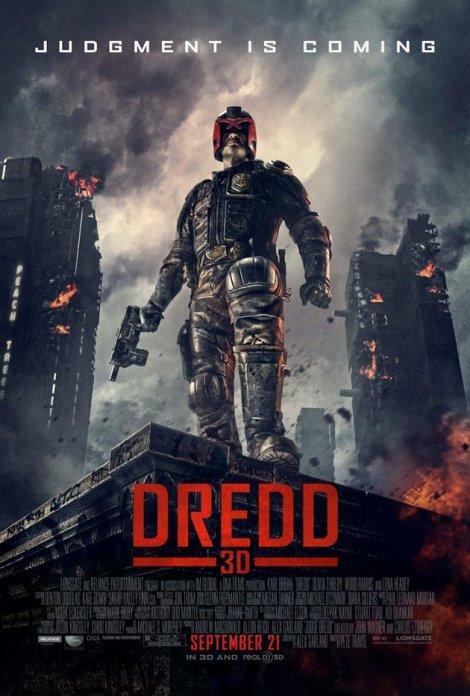 This version of Dredd is a fairly lean, focused affair, with Karl Urban putting on the helmet and never taking it off. And he does a great job in finding subtlety in Dredd’s one note character, finding subtlety through humor, and managing to create a version of the character that’s in on the joke; he knows that he’s as square as they come, but it’s the only reason that he’s lived this long. He’s either the law, or he’s nothing at all. But that can only go so far, and it falls on the Judge Anderson to the emotional heart and soul of the film. She’s a gifted psychic, but not really judge material, and Dredd is saddled with taking her out for an on the job evaluation that gets progressively more out of control. It’s Training Day in a future dystopia where the Judges are the only thing holding back total anarchy—and they’re losing that war. Olivia Thirlby adds a lot of depth to Anderson, especially when she begins to straddle the line between psychic and psychotic. She’s afraid of the madness until she decides to embrace it, and that’s when you begin to realize just how grim this future really is. The actual plotting is probably the weakest part of the film. There are a lot of key elements in the script that are either too obvious or too weak to really hold up to any logical scrutiny. It doesn’t ruin the film by any means, but it can drag you out of the world just when it should be pulling you deeper in. I can’t imagine it would have taken more than a few hours of good brainstorming to come up with something a bit more clever. Making up for some the lazy plotting are the truly spectacular special effects. Whoever was responsible for the digital animation during the drug-fueled “Slo-Mo” sequences has come up with the most unique vision I’ve seen since the Matrix took us into bullet time. Hopefully they’ll find another venue to reveal their 3D magic, because they’re truly incredible. There’s some other cool visual tricks as well, not the least of which was using some video shots to pay homage to the weird blue and yellow coloring that graced the covers of the 2100AD magazine back when Dredd originally appeared. While it’s far from perfect, this is an example kind of Sci-Fi film that I like best: direct, violent, smart, it never relies too much on spectacle, instead trying to get the basics right, and working hard for your attention. It takes you into another world, and provides some decent action sequences, even if it occasionally goes a bit too over the top for my taste. Sadly, but understandably, the film failed to find an audience, and it’s already quickly disappearing from theaters. It’s good enough that it’ll be worth watching on video (or Netflix, I’m sure) in a few months, but if you have a chance to catch it in 3D before it goes, it’s one of the few live action films besides Avatar that would be worth paying a bit extra to slip on a pair of polarized glasses to see.